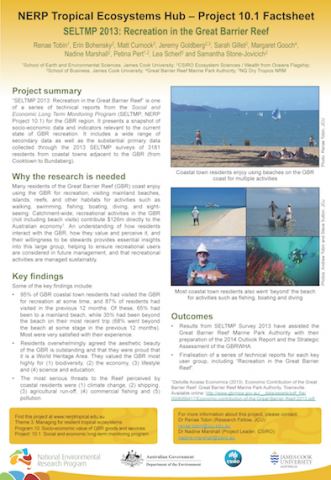 Goldberg, J., Marshall, N., Curnock, M., Tobin, R., Gooch, M., Pert, P., Bohensky, E., Stone-Jovicich, S. (2014) SELTMP 2013: A national survey about the Great Barrier Reef. 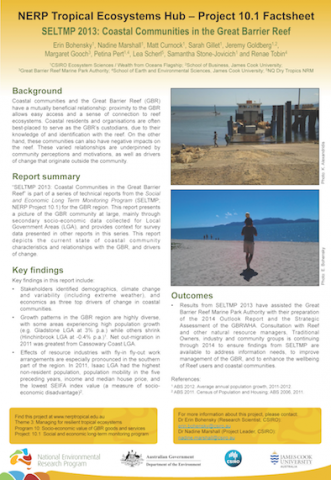 Bohensky, E., Marshall, N., Curnock, M., Gillet, S., Goldberg, J., Gooch, M., Pert, P., Scherl, L., Stone-Jovicich, S., Tobin, R. (2014) SELTMP 2013: Coastal Communities in the Great Barrier Reef. 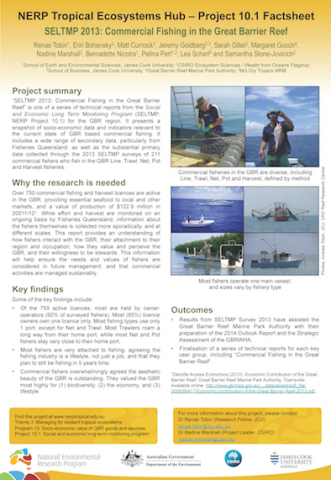 Tobin, R., Bohensky, E., Curnock, M., Goldberg, J., Gillet, S., Gooch, M., Marshall, N., Nicotra, B., Pert, P., Scherl, L., Stone-Jovicich, S. (2014) SELTMP 2013: Commercial Fishing in the Great Barrier Reef. 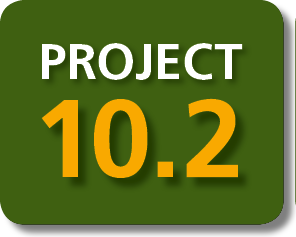 Stone-Jovicich, S., Marshall, N., Bohensky, E., Curnock, M., Goldberg, J., Gooch, M., Pert, P., Scherl, L., Tobin, R., Lankester, A. 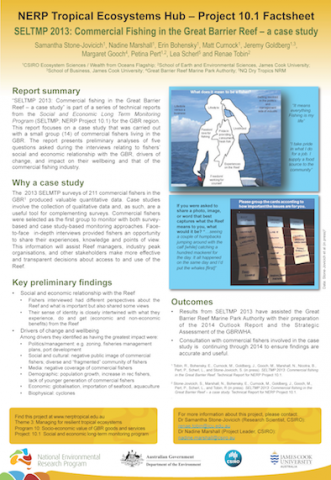 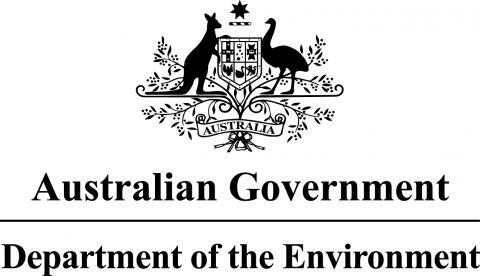 (2014) SELTMP 2013: Commercial Fishing in the Great Barrier Reef – a case study. 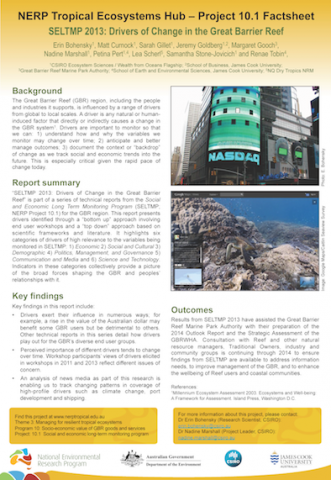 Bohensky, E., Curnock, M., Gillet, S., Goldberg, J., Gooch, M., Marshall, N., Pert, P., Scherl, L., Stone-Jovicich, S., Tobin, R. (2014) SELTMP 2013: Drivers of Change in the Great Barrier Reef. 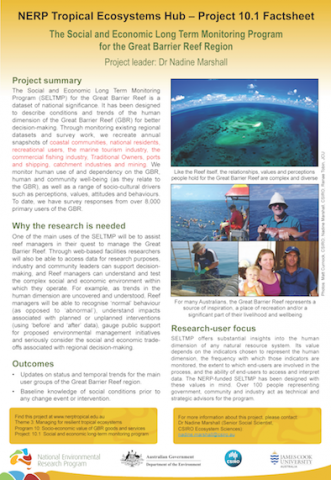 Tobin, R., Bohensky, E., Curnock, M., Goldberg, J., Gillet, S., Gooch, M., Marshall, N., Pert, P., Scherl, L., Stone-Jovicich, S. (2014) SELTMP 2013: Recreation in the Great Barrier Reef. 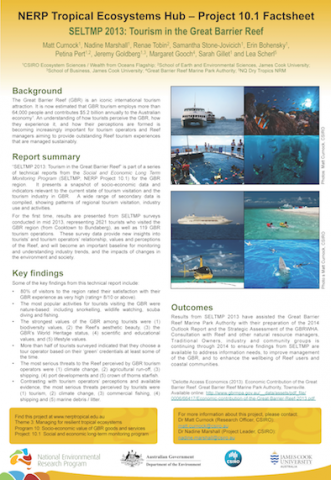 Curnock, M., Marshall, N., Tobin, R., Stone-Jovicich, S., Bohensky, E., Pert, P., Goldberg, J., Gooch, M., Gillet, S., Scherl, L. (2014) SELTMP 2013: Tourism in the Great Barrier Reef. 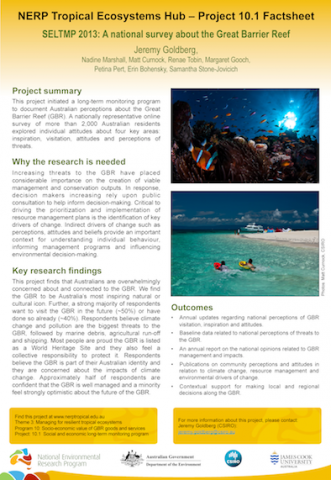 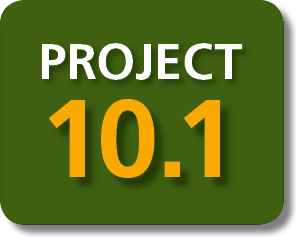 Marshall, N. (2014) The Social and Economic Long Term Monitoring Program for the Great Barrier Reef Region. 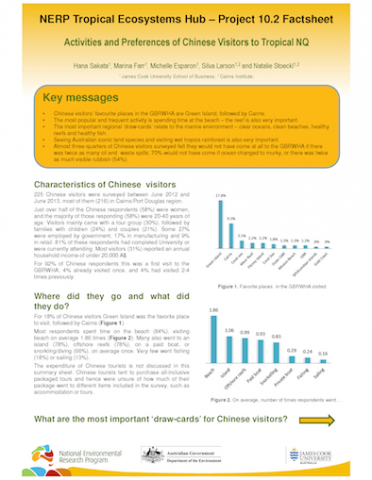 Sakata, H., Farr, M., Esparon, M., Larson, S., Stoeckl, N. (2014) Activities and Preferences of Chinese Visitors to Tropical NQ. 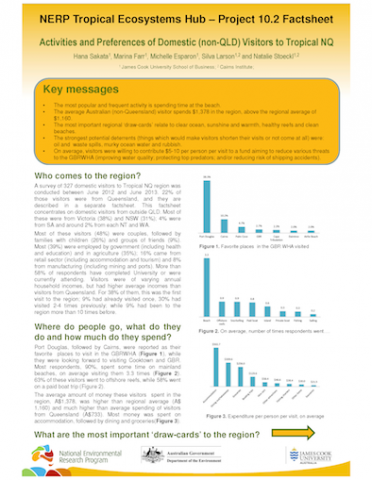 Sakata, H., Farr, M., Esparon, M., Larson, S., Stoeckl, N. (2014) Activities and Preferences of Domestic (non-QLD) Visitors to Tropical NQ.